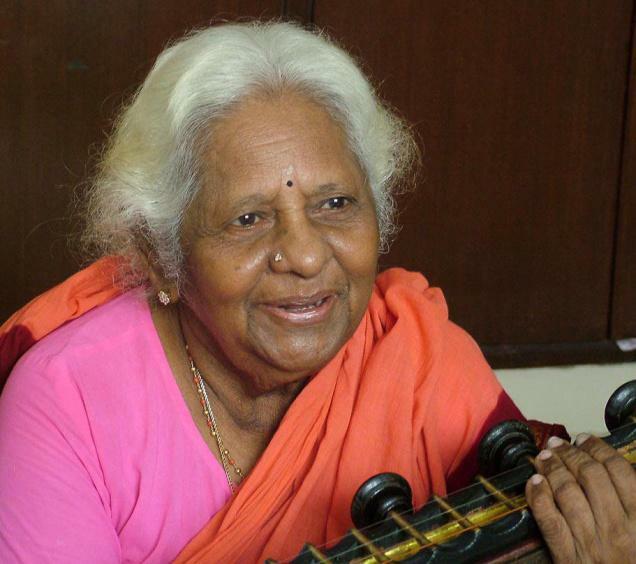 It is a sad day for carnatic music today, as Kalpakam Swaminathan, a true veena tapasvini, has left this world. Eight decades of veena playing and teaching has now become a memory. She was the first student of our guru’s father Brahmasri Ananthakrishna Iyer, and the last link between him and our generation, after the passing of our Gurus A Anantharama Iyer and A Champakavalli. Not only did she have a vast repertoire of Dikshitar Kritis, she had also mastered the compositions of many other composers. Humble, endearing, and always smiling. We shall forever hold very close to our heart the fond memories of our interactions with her (she would always introduce us to her students saying, “iva ellam ennoda school”). She would talk nothing else but music. We have had the proud privilege of hosting her concerts. Her gracious presence for some of our veena concerts and those of our disciples will always remain our most cherised blessing.